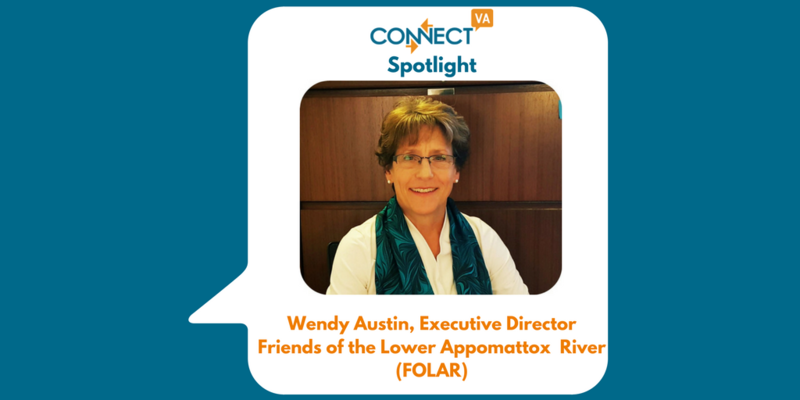 My name is Wendy Austin and I have served as the Executive Director to Friends of the Lower Appomattox River (FOLAR) since January 2015. Prior to working with FOLAR, I worked in the Hopewell/Petersburg region for two nonprofit programs, as Director of Southside Community Partners and prior to that as Director of ConnectSouthside – a precursor to ConnectVA. Before that, I was a small business owner/operator of an independent retail bookstore in the Washington, D.C. area. FOLAR works in partnership with communities to conserve and protect the Appomattox River for all to enjoy. Our vision is to make the lower Appomattox River corridor a regional destination for recreation and a catalyst for economic growth while protecting riparian ecology and education and inspiring a love of and respect for the natural environment. ABOVE: The second annual Friends of the Lower Appomattox River RiverFest was held April 30, 2016 at Riverside Park in Dinwiddie County. The event featured trail rides along the historic canal, activities for kids of all ages, music and food trucks! My work provides me with great hope for the future of our community and natural environment. A healthy river and surrounding natural environment can make our lives healthier, longer, and happier for generations to come. Balancing the scale of need with the capacity of our organization is a challenge. Like so many nonprofit organizations, the community expects and needs much from us yet we have to operate under extremely low overhead maintained by minimal staff and volunteer labor. Working to engage and coordinate all parts to work in alignment while ensuring day-to-day working capital takes full engagement from all members of our board. We’ve been fortunate to have strong committed leadership and business support. 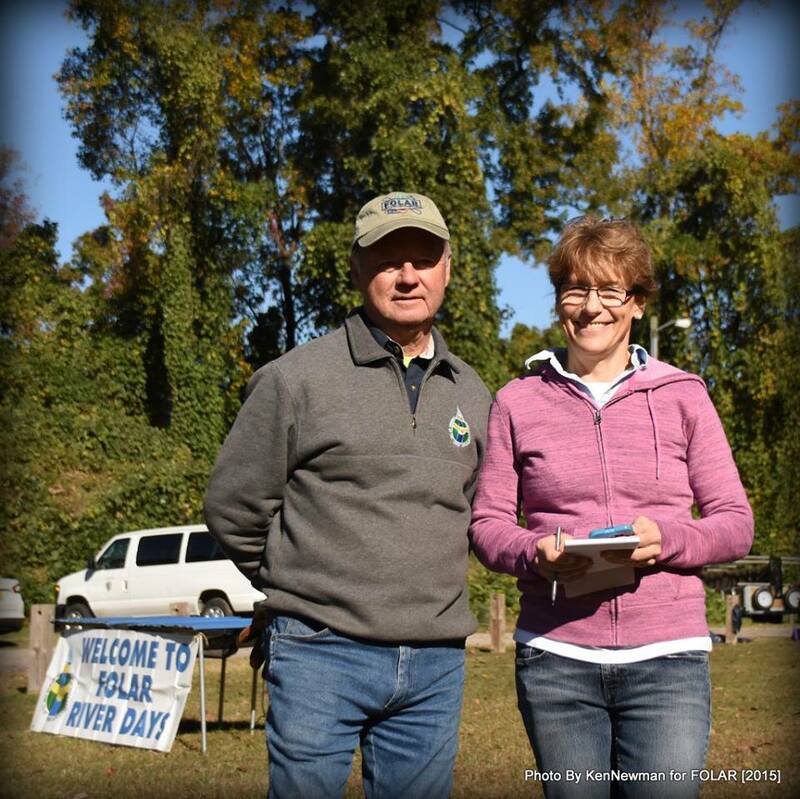 Wendy Austin pictured with Wayne Walton (Immediate Past Chair of FOLAR) working at “Canoemobile” with Wilderness Inquiry where 200+ Hopewell 4th and 5th graders got out on the river in canoes! YES! Meet ART! That’s the Appomattox River Trail and Signage Master Plan. We’ve just completed an eleven-month master planning project to guide construction and wayfaring signage development of a world-class shared-use trail along the Appomattox River. Over the next several years FOLAR will develop and upgrade the 23 miles of trail along the Appomattox River. This includes adding interpretive signage, as well as the implementation of handicapped-accessible trails and boat ramps. Photo via Richmond Magazine. Thanks to the generous support of The Cameron Foundation we’ll be rolling the plan out to the community and working to gain support for building the 23-mile-long trail from Lake Chesdin straddling Chesterfield and Dinwiddie Counties through Petersburg, Colonial Heights, Prince George County to Hopewell where it can cross the James River and meet up with the wonderful Virginia Capital Trail. You can read more about ART here. Collaboration is part of the FOLAR mission, “working in partnership”! We work in partnership with our six River municipalities and our local foundations, the Cameron Foundation and the John Randolph Foundation as well as many businesses, and of course volunteers! We are very excited to be in a new partner with the John Randolph Foundation to be able to offer the FOLAR Environmental Stewardship Scholarship for local high school students! ConnectVA is a vital resource for exchange of information for FOLAR. We use it frequently to promote our organization and events as well as research other organizations and services. 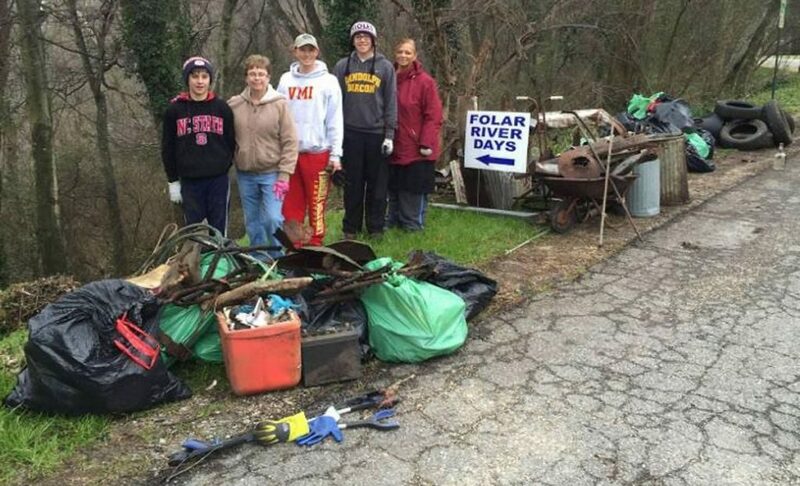 FOLAR along with the James River Advisory Council, the Chesapeake Bay Foundation, and volunteers and staff members from six localities teamed this past year to conduct 25 cleanups along the lower Appomattox River, keeping 10,000 lbs. of trash out of the River. Photo via Richmond Times Dispatch. I invite everyone to come on down any time to enjoy the very accessible beauty of the Appomattox River. We also have two exciting events coming up: The FOLAR Annual Spring River Clean Up on March 25th where volunteers are needed to restore healthy shorelines by removing litter, debris, and trash from local lands along the Appomattox River and the 2017 RiverFest on the Appomattox River on April 29th – a Day of Family Fun and Adventure, celebrating our River Heritage, Nature & Recreation! The future is outdoors! Who won’t be drawn to explore the ART! The Hopewell/Prince George Chamber & Visitor Center is open seven days a week to. help you enjoy trails, food, history, music, shopping. http://www.visithpg.com. We love our awesome member FOLAR!